First, an apology to Kelly for taking so long to publish this review. A few days ago, I finished the ebook of the novel. I was honoured and thrilled to receive a free copy of it from Kelly in exchange for an honest review. Well, honestly, it was amazing! While on their first space voyage, two Princesses from a small backwater planet find themselves hurtled across the Galaxy to a world that sees them either as saviors, come to rescue their world from a ten-thousand-year confinement, or as the greatest threat their world has ever seen. As they search for a way home, Princesses Tariana and Margeth learn things about themselves, and their universe, that they never dreamed possible. I should start this review by saying that I don’t normally read sci-fi books, or at least not many books set in space. The last one I read was Ender’s Game by Orson Scott Card which I thoroughly enjoyed. Safe to say that after finishing Stardancer, I might be keeping my eyes peeled for a few more in the genre. 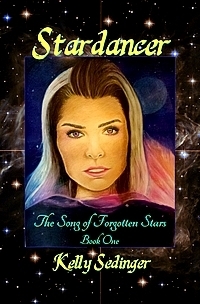 The narrative in this, the first of The Song of Forgotten Stars, is one that follows two sisters, princesses of their home planet, as they are violently separated from their mother and the comfort of their life and forced to fend for themselves in a new world where some would see them as saviours, others as a threat. The story unfolds through Tariana’s, the eldest sister, perspective as she discovers an innate ability within herself to traverse the stars and a strength to survive. As the protagonist, Tariana proves to be a great asset to the story. She is a likable character who fits well in the grey area between typical female streotypes: damsel-in-distress and Mary Sue. Though born a princess, she never embodies the snobbish side, but reveals from the get-go an urge to have more freedom. It’s this drive that really solidifies her character arc from start to finish, prompting her to adapt to the do-or-die situation that she and her sister are thrust into. That is not to say that she isn’t without her flaws, but those that she possesses work to elicit sympathy for her plight, not derision. Her relationships with the other primary characters help to deepen her development, especially that with Lt. Rasharri. The lieutenant is with the sisters when they land on the far-away planet of Xonareth and she acts as a mentor for Tariana as the girl discovers truths about herself. Rasharri is a strong character, brave and fierce, and her banter with Tariana throughout the novel injects humour while also solidifying one’s attachment to these characters. In fact, it needs to be emphasized that part of this story’s strength lies in the creation of strong and independent female characters able to save themselves from the messes they find themselves in. There were some underwhelming elements, but nothing too major to diminish my complete enjoyment of this novel! Though not a genre I’m familiar with, I feel safe to say that the strong characters and intriguing premise will appeal to fans of sci-fi as well as those less knowledgeable of the genre. A fun adventure with great characters to relate to!